The gap between the life expectancy of the rich and the poor has been increasing over time and that has big implications for the best ways to fix Social Security, Medicare, Medicaid and other entitlement programs. 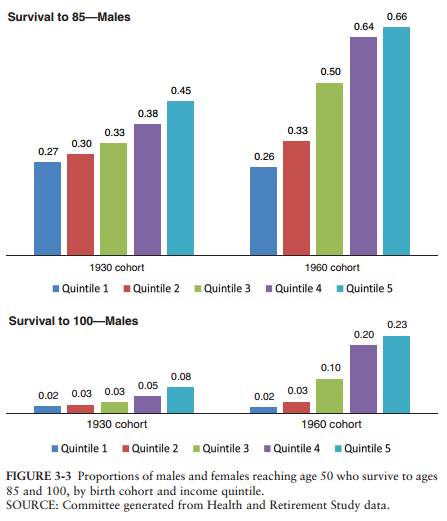 If recent trends continue, the difference in life expectancy at age 50 between men in the top 20% and bottom 20% of the earnings distribution is expected to increase from 5 years for men born in 1930, to about 13 years for men born in 1960. Virtually all of the gains in life expectancy between the 1930 and 1960 cohorts are enjoyed by the top 60% of the income distribution. Another way to see how dramatic these differences are is by examining the likelihoods of reaching age 85. For men in the bottom of the earnings distribution, the probability of reaching age 85 has barely budged over time—it was about 25 percent for men who turned 50 in 1980, and still about 25 percent for men who turned 50 in 2010 (the 1930 and 1960 cohort, respectively.) But for those in the top 20 percent of the earnings distribution, the probability of reaching 85 was 45 percent for those turning 50 in 1980, and 66 percent for those turning 50 in 2010. Differences in life expectancy can reduce the progressivity of programs like Social Security. The annual benefit may be more generous, relative to wages, for low-income workers, but because they live fewer years, the net present value of that benefit may not be much higher relative to wages than that received by higher-income workers. The National Academy report projects that widening differences in life expectancy will have significant effects on the progressivity of the entitlement programs. 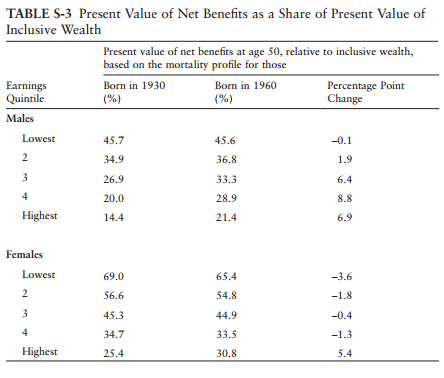 The following table compares the present value of net benefits ( Social Security, Medicare, Medicaid, Supplemental Security Income, and Disability Income benefits less taxes paid after age 50) relative to wealth under two scenarios. 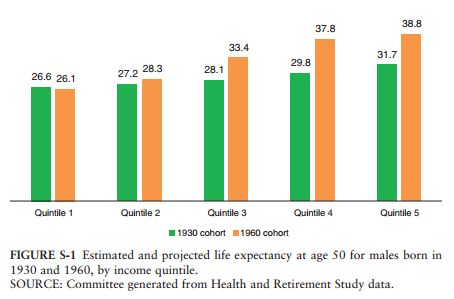 In one, people have the life expectancies by income quintile of the 1930 cohort, and in the other they have the life expectancies of the 1960 cohort. Net benefits are a much larger share of wealth at age 50 for low earners than for high earners under both scenarios—that is, by this metric, the entitlement programs still are quite progressive. 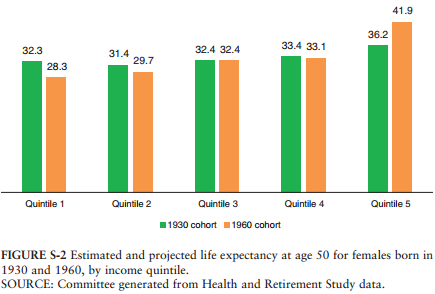 But the widening gap in longevity reduces the degree of progressivity considerably: Increases in life expectancy raise net benefits relative to wealth by almost 7 percentage points for the highest earners, while having no effect for the lowest earning men. In dollar terms, shifting from the mortality of the 1930 cohort to that of the 1960 cohort increases the gap between the present value of net benefits received by those in the highest quintile and those in the lowest quintile by $125,000. The story is similar for women. The widening gap in life expectancy by income obviously is a hugely important societal problem. We need to better understand why it is happening and try to devise policies to narrow it. But it is also important to keep it in mind when assessing policies that are intended to improve the long-term finances of our entitlement programs. As my colleague Doug Elmendorf has noted, it’s an argument for avoiding across-the-board spending cuts or tax increases and instead shoring up the finances of Social Security, Medicare, Medicaid and other entitlement programs that serve large numbers of seniors by targeting the more affluent Americans.